Skins Cycle mens rain jackets, a cutting edge, waterproof and wind resistant rain jacket, part of the superb Skins Cycle range. 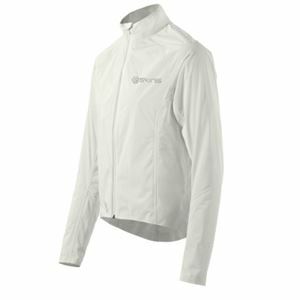 The Skins mens cycle rain jacket offers you an escape from the elements as you ride. A high visibility rain jacket with reflective logos and centre front zipper, back pocket storage and a central back pocket with zipped opening to secure your essentials. Factor in water proof and wind resistant material that forms an insulating barrier and the Skins Cycle rain jacket becomes a must have component of your cycling kit. Lightweight, stylishly designed, bonded taped seams for added water resistance, fleece lined collar for comfortable fit when fully zipped, waterproof reflective front zipper and reflective logos for all round visibility, the Skins Cycle mens rain jacket makes a lot of cycling sense.